Summer is a time of bounty for us. Several sets of catbirds have raised a few broods under our back porch and next to the house, the bees have been busy visiting the wildflowers, our resident groundhogs (we have two this year!) can't seem to stop eating, the robins, cardinals and bluejays are as active as ever, and gardens around the neighborhood are ready to burst with vegetables, fruits and herbs. I'm the first to admit that we're spoiled here in our part of Pennsylvania. The more-than-average rainfall has been good to everyone's garden. 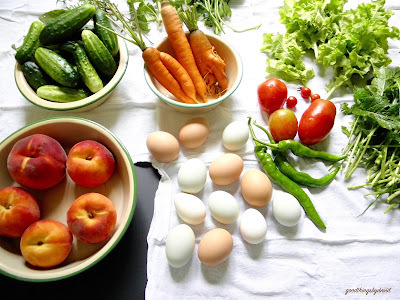 I spent a morning over the weekend harvesting a few vegetables that were ready for picking, and I collected some eggs which were greatly needed in the kitchen. The kirby cucumbers are crisp and delicious right now (garden gloves were needed to pick these because of their very prickly skins). I love using them in my salads, but they also make great pickles. The carrots are also sweet and crisp. If I'm not snacking on them in the afternoon, I will more than likely roast them with the roast chicken on Fridays. The tomatoes are great in salads, but they're also perfect for a bruschetta served with a glass of wine. The frying peppers get chopped up and sautéed in some olive oil, and are then added to a pot of simmering beans. Those colorful Flamin' Fury peaches come from our friends at Hamilton Family Orchards in Coopersburg, Pennsylvania. They're the best tasting peaches in the world! I can't say enough about the eggs. Orpingtons, Rhode Island Reds, Australorps and Araucanas are laying beauties right now. Don't tell anyone, but we're hoping that the baby Marans start laying in the coming months! I can't wait. The arugula and salad bowl greens have been so delectable to say the least. Every lunch and dinner at our home includes a salad of some kind. 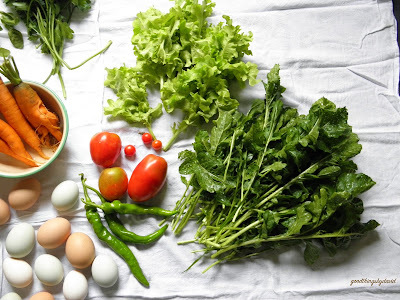 That we can compose a salad from freshly-picked greens is nothing short of amazing. Even baby Henry (he's already ten months!) enjoys the garden's bounty. 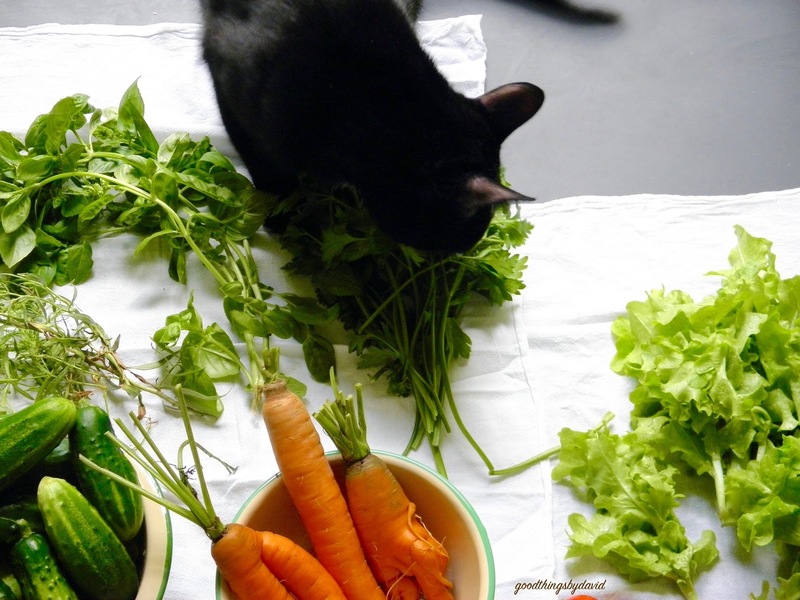 He's such a curious and lively baby cat, that he can't help but inspect every fresh fruit and vegetable that comes into the house. He especially loves the herbs! Those, by the way, get used to make pesto, garnishes and stuffings for chickens. A little tarragon under the skin goes a long way. Baby Henry inspecting the harvest. It's amazing to me how quickly the time has gone since we rescued Henry. He has established a very loving, unique and particular presence in our household. We both love him to no end. How is your summer coming along? 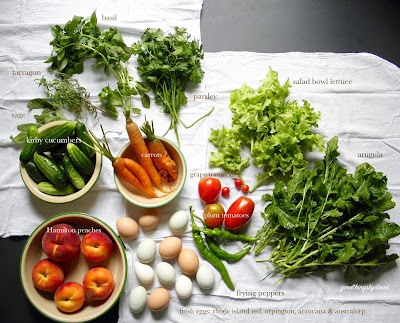 Have you managed to plant, grow and harvest a little something in your area? Even if you haven't, farmers markets are filled with fresh produce, meats, cheeses and eggs right now. Everything is delectable, and everything is worth trying at least once. I hope that you're supporting local farmers and small businesses in your area. Here's to a great summer! Liz, I'm glad I woke up to good news today that your account was back!!! Thanks for the lovely comment and keep doing what you're doing!!! I love all of your posts!